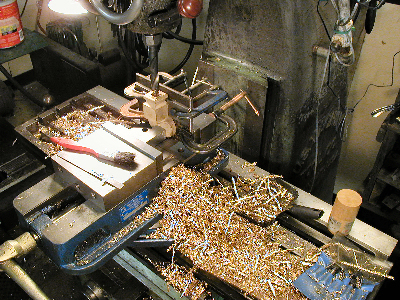 I, Pete, have been working with metals since I was 7 years old. In high school I took a couple of machine shop classes to help formalize what I was doing at home. I used a 6" Atlas lathe in an electronic repair shop on and off for a couple of years, but didn't obtain my own lathe until about 1969. In 1977, after moving around the country with my job, we settled in western Wisconsin and started building my current shop(s). In 1986 I joined the Guild of Metalsmiths, a Minnesota/Wisconsin blacksmithing organization. This Guild is now over 30 years old and has a liberal sprinkling of mentors. In the early 1990's I begin taking an evening vo-tech course called "Machine Shop 101" 2 semesters a year, for several years. This was an inexpensive way to get to learn and to use a much wider array of machine tools than I would ever have access to at home. It helped me in deciding what tools and tooling I would need in my own shop. In addition, this class was run by professional instructors, who have added greatly to my abilities. For most of my life, I have been designing and making parts for whatever hits my fancy, as well as for equipment around the place. Many relatives and friends bring me jobs to do, some gratis, and some for pay. This wide variety of things coming in the door keep me hopping and pushes my skill level. Now I even have some regular jobs coming in and I do some reverse engineering for others. In this process, I have even become CAD-proficient, to a fair degree, using TurboCad. A nice heated Shop has grown up on our place over the years.